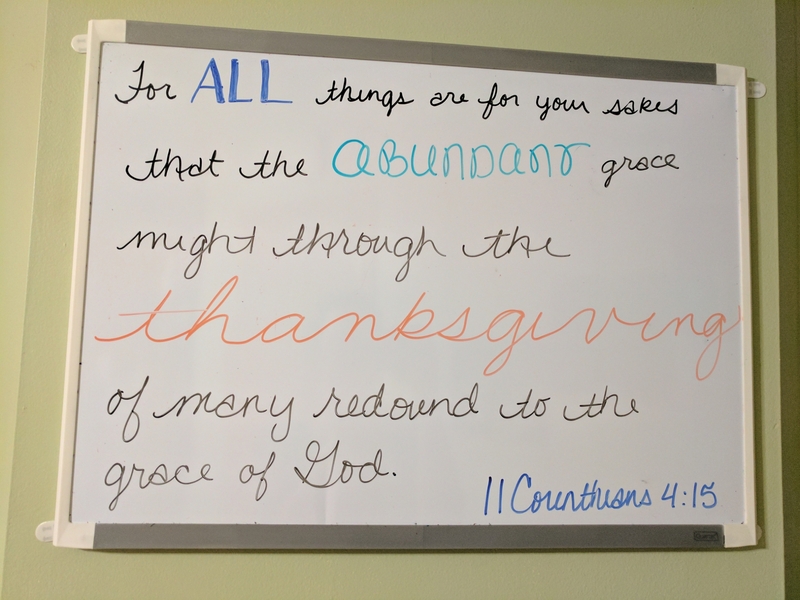 When I was looking for another verse on thankfulness, I was struck by the fact that this verse is only a few short verses away from my favorite verses in the whole Bible (II Corinthians 4:17-18), so I decided to read the entire chapter to see how they worked together. It’s always good to look at a verse in context, but first, let’s dissect and define it. All of my definitions for Scripture Saturday are coming from the 1828 Webster’s dictionary because it was published close to the same time as our modern KJV Bibles; therefore, the definitions will be accurate to the meaning of the words at the time of the translation. Also, often times the Webster’s 1828 will actually use Bible verses for examples within the definitions. If you want to use this dictionary for your own study, a hardcopy can be pretty pricey, but I found it for a new lower price here. Alternately, you can get the dictionary as a free app in the app store or Google Play store. Sakes – 1) Final cause; end; purpose; or rather the purpose of obtaining. I open a window for the sake of air, that is, to obtain it, for the purpose of obtaining air… Sake then signifies primarily effort to obtain, and secondarily purpose of obtaining. 2) Account; regard to any person or thing. Abundant – Plentiful, in great quantity; fully sufficient; as an abundant supply. Grace – 1) Favor; good will;kindness; disposition to oblige another; as a grant made as an act of grace. 2) Appropriately, the free unmerited love and favor of God, the spring and source of all the benefits men receive from him. Redound – 1) To be sent, rolled or driven back. 2) To conduce in the consequence; to contribute; to result. 3) To proceed in the consequence or effect; to result. Glory – 2) Splendor; magnificence. 4) Praise ascribed in adoration; honor. 5) Honor; praise; fame; renown; celebrity. Now to put it back together, if you look at the context, Paul is talking about how he and the other followers of Christ are facing persecution, but it’s all for God’s glory. So basically, if you are giving God the praise and thanks for everything that comes into your life, even when it isn’t pleasant, you are making God bigger in the eyes of those around you. Your testimony through difficulty and through blessing is how the people around will view God. Make Him bigger, no matter the situation. Give Him THANKS! If you would like a little more encouragement, memorize through the end of the chapter. Verses 17-18 are so encouraging to me in difficult times!